The University of Utah Sustainability Office wrapped up the 2016-17 academic year with two major collection events that kept large amounts of reusable — and even toxic — items out of the landfill. Did you miss one of these events? The Salt Lake County Health Department hosts free hazardous waste collection events throughout the summer at various locations in the metro area (list of events). Pharmaceuticals can also now be dropped off at the Rx Drug Disposal Drop Box at the Salt Lake County Government Center, 2001 South State Street, North Building. In April, the Sustainability Office hosted its annual U Recycle Day in partnership with the Salt Lake County Health Department. Nearly 200 people dropped off either electronic waste, paper for shredding and recycling, or both. Samsung funded the e-waste collection, with Metech Recycling handling the collection and proper recycling and disposal of the electronic parts. Swire Coca-Cola funded paper shredding. In total, the event prevented nearly 9,500 pounds of electronics — which can contain hazardous materials such as lead, mercury and other harmful chemicals — from entering the landfill. Volunteers and staff collected 5,319 pounds of TVs, 1,038 pounds of computers and parts and 3,106 pounds of miscellaneous materials. Sustainability staff members (L-R) Ayrel Clark-Proffitt, Ginger Cannon and Emerson Andrews, display some of the donated items at the 2017 residence hall move-out donation drive. In early May, the Sustainability Office partnered with Housing & Residential Education (HRE) for the annual move-out donation drive. 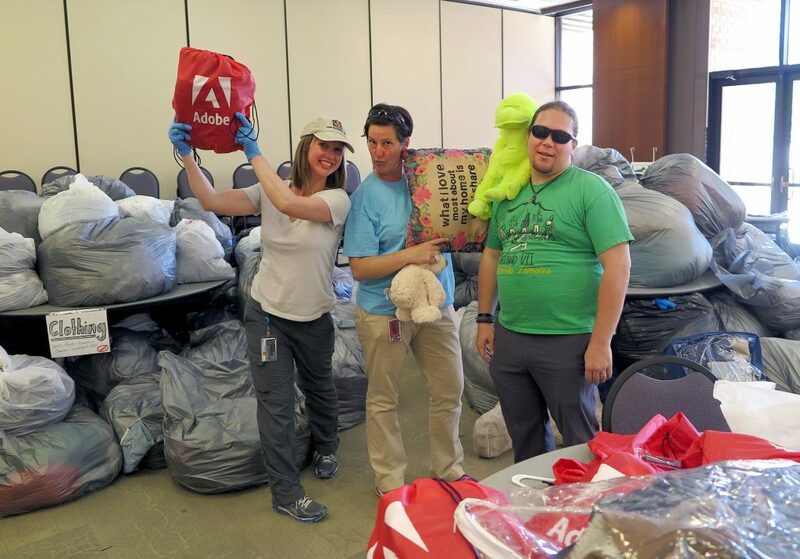 Sustainability staff and volunteers worked with HRE employees to collect and sort reusable items left by students moving out of campus residence halls. Students could donate clothing, blankets, pillows, kitchen items and more to Big Brothers Big Sisters of Utah. Unopened food was also collected and donated to the Feed U on-campus food pantry. In previous years, items have been collected from buildings in the Fort Douglas area. This year, the team added the Marriott Honors Community and Lassonde Studios, making this the largest collection in the history of the program. Matthew Draper, director of the Big Brothers Big Sisters of Utah Donation Center, said it took two trucks to remove all the donated items. Items from the collection were sold to help match mentees with mentors in the program.